The Chorus effect was originally designed to simulate several voices, just as if several persons were playing together the same notes, but with a variable delay between them. 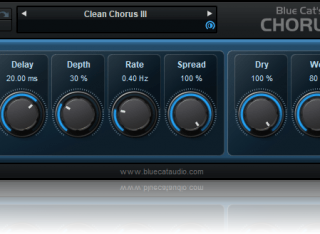 This is one of the typical effects that you can get with Blue Cat's Chorus. But this plug-in also enables you to drastically change the original sound and create deep pitch modulation or crazy 'bubbling' effects. With the additional "Spread" control on the stereo version, the famous stereo widening and head spinning chorus effects are a few click away. (Bug fix): in some plug-in adapters (like fxPansion's VST to RTAS adapter) the GUI did not display properly when first loaded. 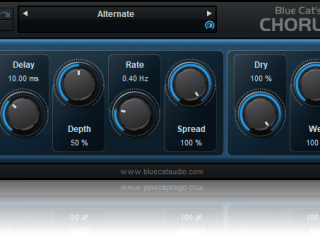 Blue Cat's Skinning language V1.2.1 support. Now supports one skin per preset and a global default skin: customize each instance of the plug-in in the same session. Brand new skinnable Graphic User Interface using Blue Cat's skinning language.